10% Discount until April 30th. 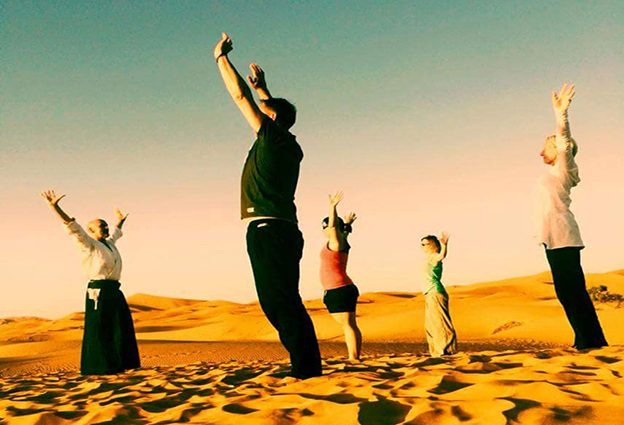 Includes: Transportation with local guide (english / spanish), accommodation in double occupancy, breakfasts and dinners (Marrakesh only breakfast), excursion with dromedaries, night at Bivuag at the dunes, and yoga daily yoga / meditation (in room and desert). The Sahara desert, the largest desert in the world, is a dream of the explorers . There is nothing like watching the sunrise / sunset in the Sahara, and at nightfall contemplating a million stars in the presence of silence. We have designed this trip specifically to harness our inner power in a place that radiates its own natural strength. 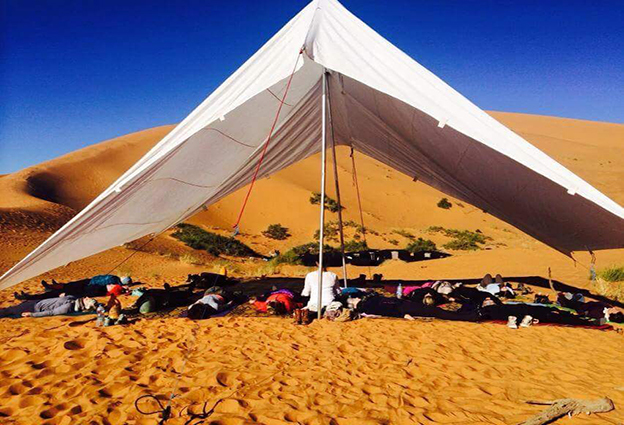 This is not a luxury yoga retreat. 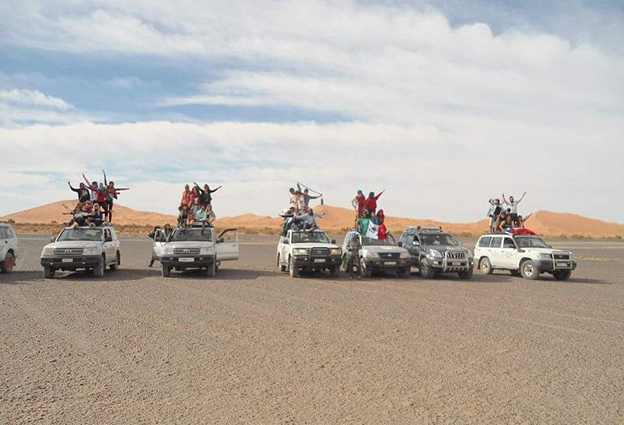 We will go by 4×4 through the mountains of the High Atlas and then through the Sahara we will reach our comfortable camp in the desert, where we will embrace the essence of the nomadic life. If you are looking for a totally relaxing vacation, this trip is not for you. 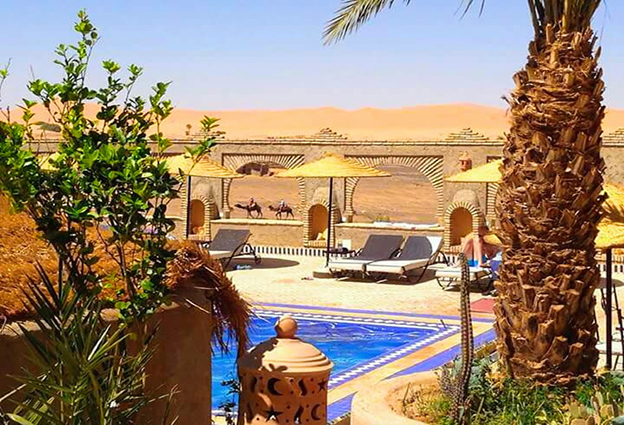 If you are looking for an experience that will provide you a challenge in the desert and then take you back to a fantastic riad in Marrakech, this is the perfect trip. Yoga and travel enthusiast. Currently living in San Miguel de Allende, Mexico. I studied Architecture and Drama Therapy. I am a Kundalini Yoga instructor certified by 3HO. Practicing yoga in my daily life gives me spiritual strength, helping me to maintain important values like honesty, compassion and being present in my relationships with others. 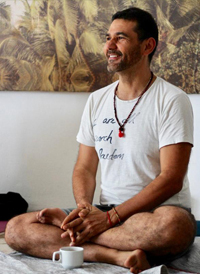 Omm Retreats is a deeply personal project that integrates being a tour guide and a yogi. Believe it or not, they have a lot in common! To travel is to experience the world in all it’s aspects, and yoga is to pursue an inner experience acknowledged with every breath, movement and meditation. Both are a round trip. I look forward to seeing you on our next trip. I feel grateful to share this experience with inspiring instructors in unique spaces, surrounded by nature and wonderful people. Arrival at the airport of Marrakesh where you will meet the driver who will take you to the hotel. Rest of the day free to enjoy the city of Marrakesh, discover the medina with its hundreds of streets and shops, the souks, the gardens and the Jemaa El Fna square, declared by UNESCO as Patrimony of Humanity in which you can enjoy shows, musicians, acrobats… accommodation in Riad. Departure early from Marrakesh towards the Atlas mountains, going up a winding road dotted with villages of traditional stone architecture. Visit to the most famous of the valley’s Ksour , Ait Benhadou, declared by UNESCO a World Heritage Site. 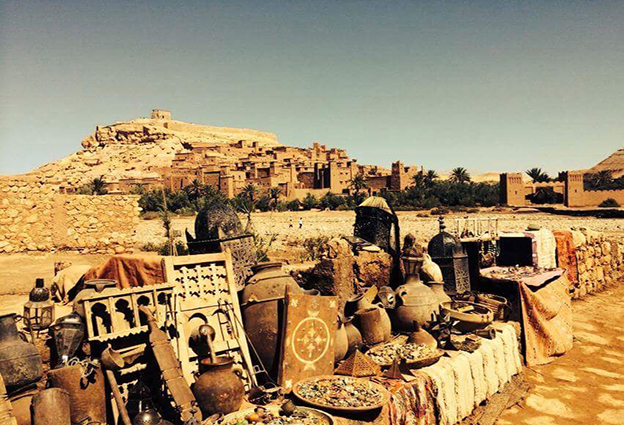 We will go on to Ouarzazate where we will visit the Kasbah Taourirt, lunch in Ouarzazate. Arrival in the Valley of Roses in the afternoon. YOGA in the middle of the Valley, dinner and accommodation. Breakfast at the hotel and departure towards Merzouga. During this day you will cross the valleys of the South face of the High Atlas, passing through the Mgoun river, the Dades valley, its impressive gorge and the Monkey fingers, the gorge and the Todra palm grove, all beautiful natural landscapes that combined with the traditional adobe architecture creates a very attractive environment. 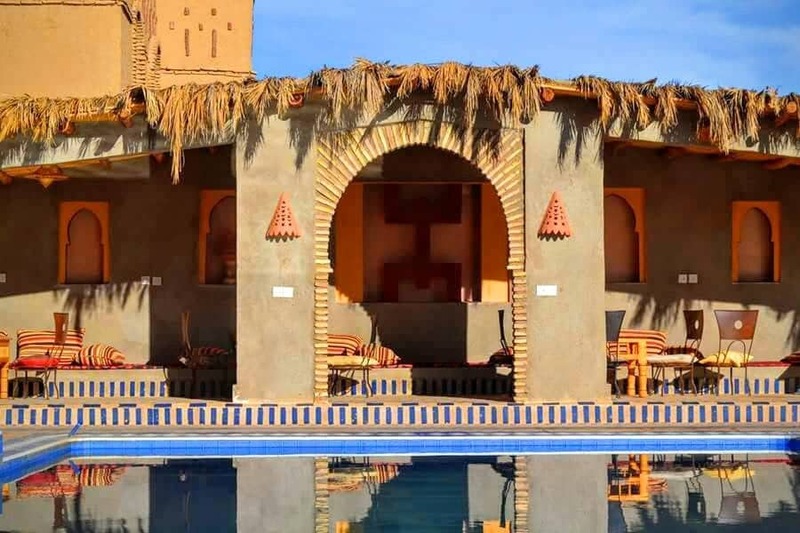 At mid-afternoon we will arrive at the sensual dunes of Erg Chebi at Hotel Kasbah Azalay. 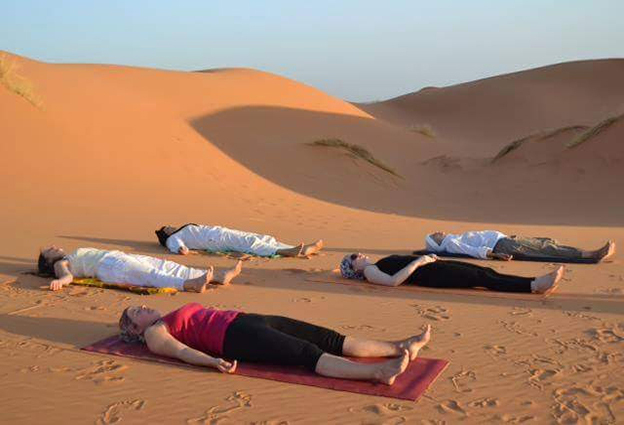 Afternoon free for YOGA overlooking the dunes. Dinner and overnight at the hotel. Breakfast in Kasbah Azalay and route with the 4 × 4 vehicle around the dunes, visiting the village of Khamlia, where we will enjoy the traditional gnawa music, the mines of Mfis, the abandoned village of Merdani, the immense hamada, the nomadic khaimas, the small palm groves such as Hasi Labiad… In the afternoon departure with the dromedaries of Kasbah Azalay in the direction of the camp of Khaimas in the dunes, we will enjoy the sunset and YOGA. Dinner and accommodation in Bivuag (traditional tent). Sunrise in the dunes and return to Kasbah Azalay Merzouga for breakfast and take a shower before departure to Marrakesh. 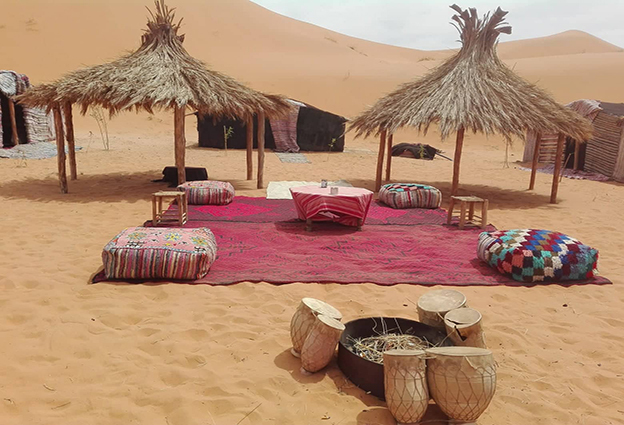 When leaving Merzouga, we will take the road that leads from Rissani to the Draa Valley, desert landscapes dotted with small towns and cities such as Alnif, Tazzarine or Nkob. The vast valley of the Draa surprises travelers by its leafy surroundings surrounded by such an arid environment. Stop at Tamnouglat to take a walk through the pleasant adobe Ksar and continue up the valley towards Ouarzazate and crossing the Tizi n Tichka, Tichka pass in the direction of Marrakesh (we will arrive late in the afternoon). Lunch en route. Dinner and stay in Marrakesh. Breakfast in the riad and day to know Marrakesh by your own or in group: visit the monuments of the medina, such as the Bahia Palace, the Saadian Tombs, the Ben Youssef Medersa, the Jemaa el Fna square, the diverse gardens of Marrakech, the Menara with its pond and its pavilion, the Arset Moulay Abdessalam, or the Majorelle gardens (a small paradise of tropical plants). YOGA afternoon on the terrace of the Riad, lunch and dinner at your own. 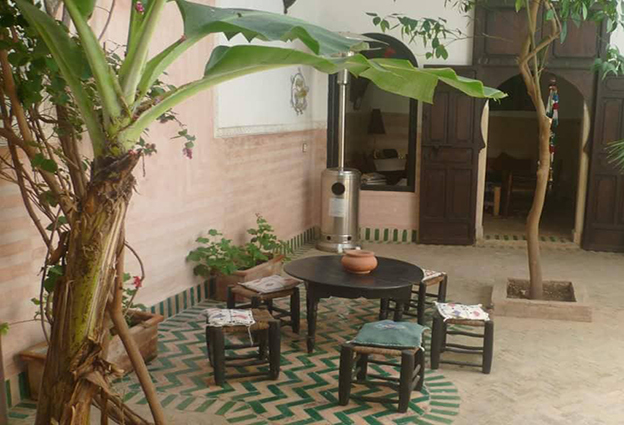 Riad accommodation. Breakfast at the riad and transfer to the airport to take the flight back home.